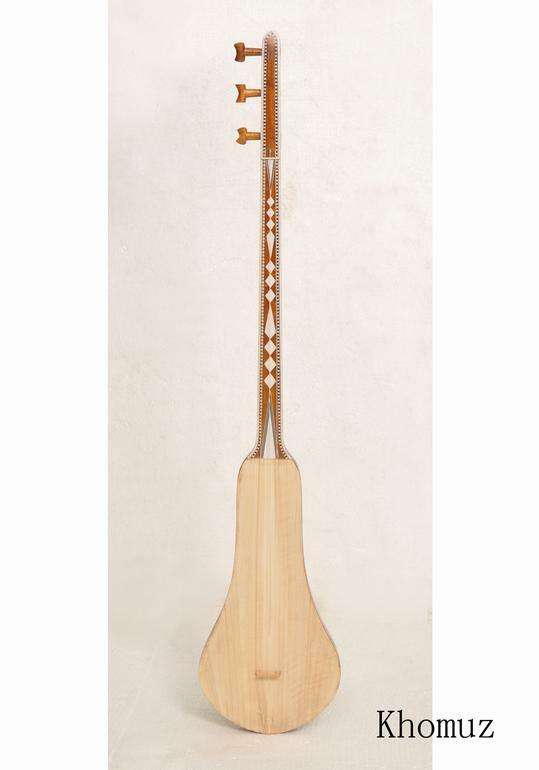 Among the numerous national instruments the most widespread and popular is the Khomuz, which has rich repertoire. It is a stringed instrument, made from a single piece of wood (apricot or juniper are the favoured timbers), and plucked like a guitar. While playing it, the three strings are clasped by the left hand to the fingerboard and the right hand is used to pluck the strings in a variety of ways to draw out the sounds.Today, the body of the Khomuz is usually made from a single piece of wood, but at one time there was a hollow in the body which made the sound resonating from the instrument even deeper.It is a very versatile instrument and can be played by either men or women, boys or girls – as a solo instrument, as part of an larger group, or as part of a larger folkgroup ensemble featuring other traditional instruments. It is not unusual to see young children in the streets of Bishkek carrying a Khomuz as they make their way to, or from, lessons in one of th city´s specialist “Music Schools”.It is a very old instrument. In 1962, near the village of Shamsy in the Chui valley, archaeologists made a number of amazing discoveries – including the famous “Golden Mask” along with … a Khomuz – dating from the 4th and 5th centuries.While designed for a professional musician, the artisanal craftsmanship and beauty of the Khomuz will appeal to all art collectors as a beautiful and traditional piece.Shipping:Please allow 20-30 days for priority shipping, express shipping options are also available.Every Khomuz is packed in a custom-built wooden box to ensure safe arrival.